Any container or shady garden spot can become a fairy garden. 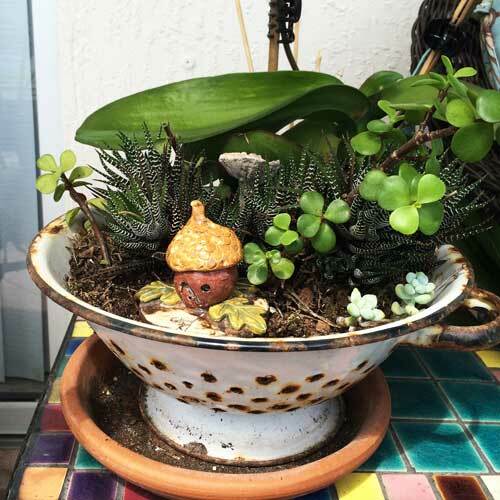 Here I used some pieces from a broken flower pot, a heart-shaped piece of coquina (see below) I found on the beach, a miniature chair from a craft store, and two of my own fairy garden cottages. I added a few plants with small leaves, succulents, and moss and I have a charming little place for fairies to move in. Flower pots make nice containers and so do other containers. One of my favorites is this antique colander my husband found at a thrift store. It has enough room for the plants, good drainage, and a little charm that a regular flower pot just can’t display. I have a small acorn house from my stash in this one. 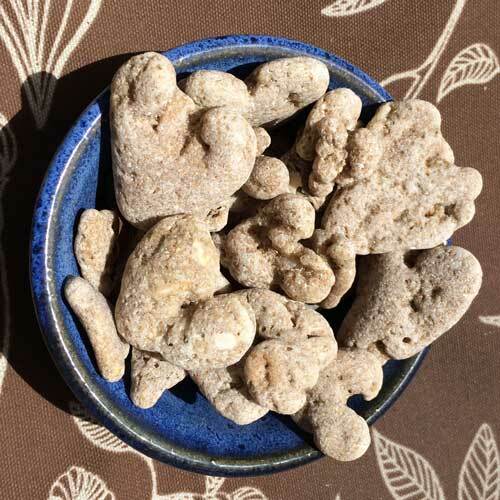 I have a collection of heart-shaped coquina pieces from the Atlantic ocean shore. Coquina is a “stone” composed of tiny bits of broken sea shells and sand. It washes to the shore in various shapes and sizes and I only pick up the heart-shaped pieces as they make great stepping stones or decorations for my tiny gardens. Thrift stores are full of inspiration. My husband and I can spend hours perusing the vast collections of antiques and rustic items. He likes to look for woodworking projects and I love to search for a variety of things for my collections and fairy gardens. Take a walk. Acorns, pretty stones, sticks that look like old trees, and more can be found for free right out your back door. Even bottle caps and other “finds” can be upcycled into adorable little fairy garden accessories. Pinterest.com has a plethora of ideas. Visit my Pinterest link below (Find Me Elsewhere) and look at my Tiny Gardens board. Other folks have some nice collections of photos for inspiration as well. Craft stores now have lots of fairy garden items including tiny chairs, umbrellas, fish ponds, and beautiful little fairies. Etsy.com is a great place to shop for handmade items for your fairy garden. You will find doors to lean against trees and a huge assortment of houses and accessories. Shop day or night and click on your favorites to store them as a collection. Then you can see how well they go together. You can purchase a few or many. Once your collection has a nice variety of items you can begin to place them in flower pots, under shady trees, or even in a terrarium. Once you begin collecting you will probably see that your taste runs in a certain direction. That is when your fairy gardens can really come to life! 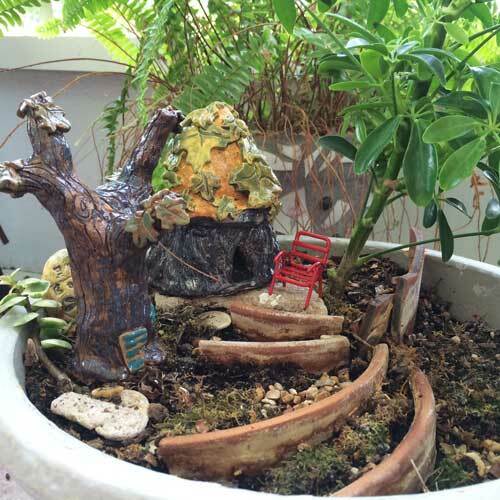 I would love to share your story and photos of your fairy garden. Feel free to contact me at dwaldorfjohnson@gmail.com.